Objective: This study aimed to investigate the knowledge levels of intensive care unit nurses on central venous catheter (CVC) care and follow-up. Material and Methods: Data for the study were collected at the intensive care units of hospitals in a city center during face-to-face interviews conducted between October and December 2012. Of 102 nurses working in the intensive care unit, 68 volunteered to participate in this study. Results: It was found that the mean age of the nurses was 30±2.83 years. Most of them were the vocational high school graduates, and they were working in the intensive care unit for less than a year. The mean score of the nurses’ level of knowledge related to CVC care and follow-up was –X ±SD=6.81±2.132. In this study, there was no statistically significant relationship between age, education levels, professional experience, working years in the intensive care unit, and knowledge levels. Conclusion: Findings of the study revealed that most nurses’ levels of knowledge on CVC care and follow-up for preventing CVC complications were not sufficient. A reliable and correct operation of CVC requires appropriate theoretical knowledge and experience. 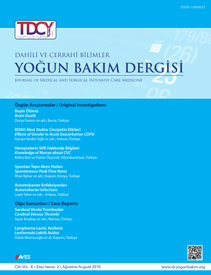 It is thought that it would be useful to first provide information on catheter care in institutions providing nursing education, and then to arrange in-service training programs about CVC and to show its practical applications for nurses in small groups in institutions offering health services.